Kylie – too many albums to mention! Morcheeba – Big Calm, Who Can You Trust? Swing Out Sister – too many to mention! I have a lot more one-off tracks than albums but I think I’ve already listed enough. The owners lounge still says ‘On Order’, the phone line still says ‘Scheduled but no date’ so I’m thinking I got excited for no good reason. Upside, though, is that I get to go through that excitement again when it really does happen. Its only three days until production month, so I have fingers crossed to see something change soon. When I ordered the MINI I put some accessories on there, figured they were small and inexpensive. But according to this posting over on dbmini, just installing the aux input might cost me $125!! So I think I’ll remove all the accessories and do them myself. Only thing I’m not sure of yet is an alarm system. I say they don’t stop anybody from stealing the car but my wife thinks they make a great deterrent to the ‘casual’ thief. $499 plus install might be worth it? The order tracking page still says ‘On Order’ but, inpatient fool that I am, I called 1-866-ASK-MINI and they said that is ‘Scheduled For Production’ but with no confirmed date yet. Getting closer!! And it looks like I got my seat cover change made just in time. Author adminPosted on June 24, 2005 Categories General4 Comments on Scheduled For Production! Coming into work this morning, car alongside me beckoned me to open the window. “Hey, does the UK on your plate mean Kentucky? ?” I gave him my ‘are you mad’ look and said that it was for the United Kingdom. He said “too bad” and drove away. I met him again on the bus from the car park and he explained to me that the University of Kentucky is referred to as ‘UK’ so it wasn’t as crazy as I thought. Well, maybe not. But just in case there is still confusion here is a description of the United Kingdom which you will see has no resemblence to the University of Kentucky. Author adminPosted on June 24, 2005 Categories My MINI4 Comments on Boy, You From Kentucky? 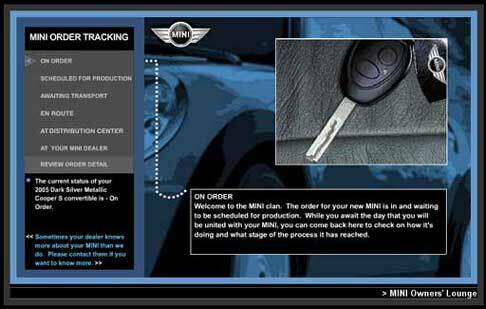 So of course I am checking the Owners Lounge every day to see if my new MINI is progressing any, and each time I go there I see the picture of the cool blue convertible on the login page. It surely is a beauty, makes me wonder if I have made the wrong colour choice…. I do need to call my sales advisor and make a couple of changes, going to change to cloth seats, many people have pointed out to me that when its 110F (as it was yesterday), it is not going to be possible to sit on the leatherette without getting first degree burns to delicate parts. I did email my advisor a couple of times but she doesn’t seem to be an email person as I’ve had no replies. Its been almost two weeks and they haven’t put the deposit on my card yet or sent me any receipt, confirmation, brochures as promised. I guess I need to get on the phone and see what’s happening. I know its only been four days since I got a production number and I know that my production date will be in July. But I sooooo want to see my tracking page updated with a scheduled production date. Looks like I am not going to be immune to the order wait madness, after all. Can’t wait to get entered into the system and start watching mine get built. Author adminPosted on June 10, 2005 Categories My MINI4 Comments on Finally, New MINI News! Where’s The New MINI News Then? Yeah, ok, I said I’d have news pretty soon and so far there’s not been any. I really did think that by now I’d have news but as I sit here today I still don’t have any to pass on. I thought I would. Really, I did, I wouldn’t lie to you, dear reader. Maybe tomorrow. The MINI has been making some nasty noises whilst braking recently so I decided to put it in the local brake emporium to check out putting in some new pads (and I am sure they will insist on discs too). So that meant taking the Jeep to work today. [Update:] Rear brake pads were worn beyond use but replacement pads weren’t available or orderable!! Had to go up to Brecht and buy them over lunchtime and will take them back this evening… grrr!!! There are definite downsides to owning a MINI. Of course today would be one of the windiest days in the mountains so not only was I struggling up the hill in 3rd and 4th gear but also keeping a white knuckle grip on the steering wheel to stop us from being blown off the edge. The Jeep has a 3.5 inch lift and 33″ tyres making it quite unstable. It does however allow for a nice view into the passing cars when the driver is worth a look. The mirrors were moved to allow the doors to come off but when I put the windows back in last night they totally blocked the right hand side mirror, can’t see it at all. This combined with a rear window that was almost opaque made for some careful lane changes on the freeway. Despite only getting 80 miles on half a tank of gas I still got to work in under two hours and I actually had a lot of fun. It will be a shame to sell it but I only drive it 4-5 times a year and it seems pointless to keep it in the garage paying insurance, registration etc for that. And even more so when the value could be applied to the new MINI – news about that real soon.